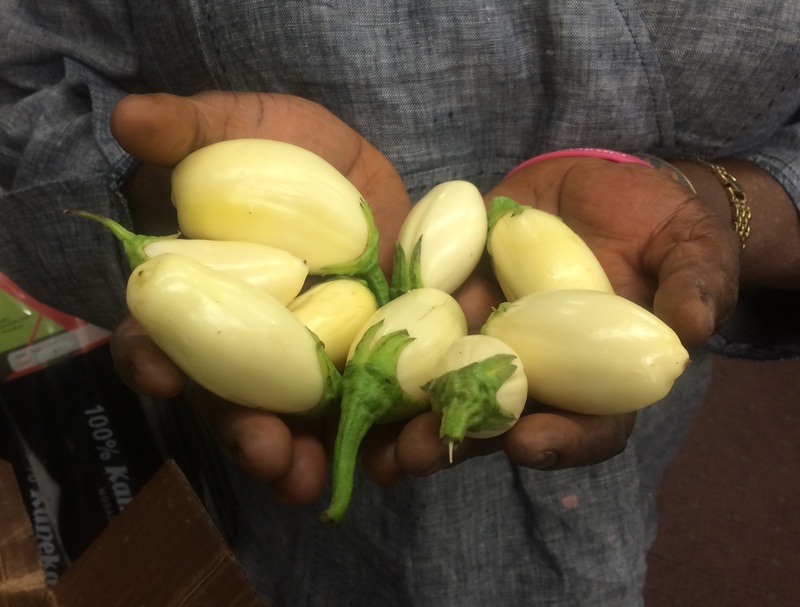 Garden egg is a type of eggplant that is used as a food crop in several countries in Africa. It is a small, white fruit with a teardrop or roundish shape that is valued for its bitterness. There is debate on the specific species of garden egg. Solanum aethiopicum is suggested in some sources (National Research Council of the National Academies. 2006), which includes types such as “garden egg,” “scarlet eggplant,” and “gilo.” Others suggest the species S. gilo is synonymous to the S. aethiopicum Gilo group (Danquah and Ofori, 2012). Garden egg is an important crop in several African countries and is indigenous to sub-Saharan Africa. It can be stored for up to three months by letting it dry. This is a useful characteristic in the tropics given the lack of refrigeration in some rural areas. In Ghana, garden egg is one of the three most consumed vegetables, along with tomatoes and peppers. In 2007, total production of garden egg in Ghana was estimated to be over 66 million lbs. (Horn et al., 2007). In Côte d'Ivoire, garden egg was reported to be the second most important vegetable crop after okra (Aliero, 2007; Siemonsma, 1981). It is used in stews and eaten raw (Figure 1). The stems and leaves of garden egg are eaten in some African countries, but not in Ghana. Garden egg is used as a less expensive meat substitute because its spongy texture allows it to absorb other flavors, similar to meat (National Research Council of the National Academies. 2006). Stores in Massachusetts that cater to the African population sell canned garden egg. The packaging shows a teardrop shape (Figure 2, Figure 3, Figure 4, Figure 5). Markets in Massachusetts, however, usually sell garden egg from outside the state that is larger and rounder (Figure 6). In general, market owners have expressed preference for the larger, rounder type. This is inconsistent with the fact that the teardrop shape seems to be common in Ghana, based on the pictures on the canned garden egg. Researchers at UMass introduced a fresh teardrop type of garden egg to African markets in 2014 and 2015 (Figure 7, Figure 8). Garden egg popular in Ghana has a similar shape and growth pattern to jiló, a popular eggplant in parts of Brazil. Jiló is also known and appreciated for its bitterness. In fact, one of the garden egg types on the can of the processed garden egg in Figure 2 looks much like one type of jiló (translating from Portuguese to "long, light green" in English). This could be why in 2014, two types of jiló grown at the UMass Research Farm were introduced to an African market in Worcester and were sold as garden egg (Figure 10, Figure 11). The owner said that his customers, dominated by Ghanaians and Liberians, prefer white types, but he was able to make the case to his customers that the taste and bitterness of the Brazilian types are very similar. In 2016, the comprido verde claro type of jiló was successfully introduced to a cooperating market in Roxbury Massachusetts, along with the tear-drop white type. Some African customers at this market said that they prefer green types of garden egg. Innocent Nwosu, A Nigerian working with UMass on this work, said that in some regions of Nigeria the preference is for green types over white types (Innocent Nwosu, Personal communication). We also met a customer from the Democratic Republic of the Congo who also preferred green garden egg. Here is a video showing the promotional materials and the white and green garden egg grown in Massachusetts for sale at market in Roxbury that sells many products popular among Africans. In addition to canned garden egg, frozen garden egg is commonly found in the growing African markets in Massachusetts (Figure 12). Some are grown and frozen in Africa and shipped to the United States. In addition, market owners in Massachusetts will freeze fresh garden egg grown in the United States to prolong shelf life. Customers, however, prefer the vegetable fresh. 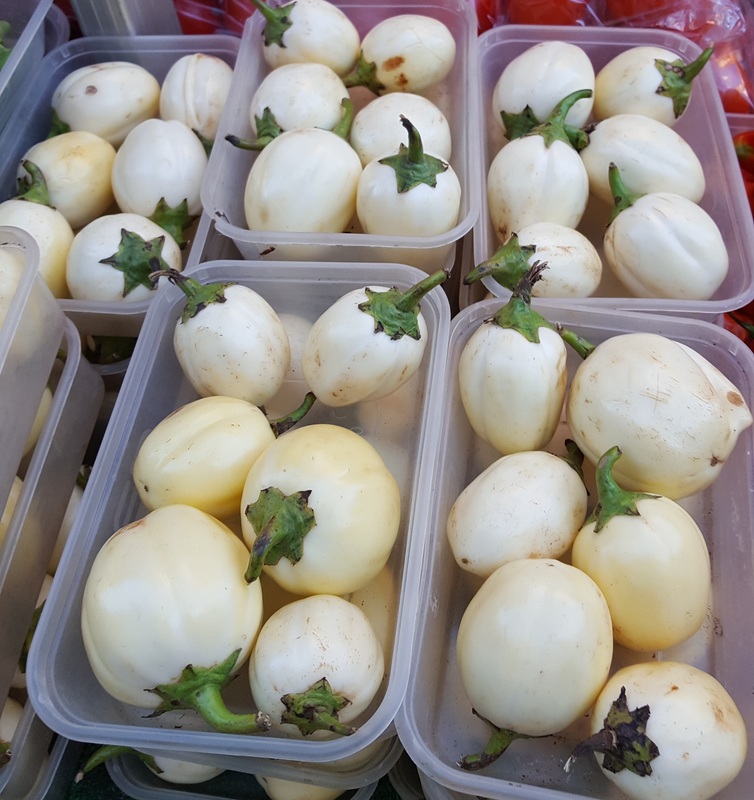 Visits to markets in Washington DC in June 2016 found three different types of garden egg for sale in African markets. Two were small, teardrop types; one was white (Figure 13) and the other was white with green stripes (Figure 14). Both turned orange as they matured. The third type was white and much bigger. It had not turned color at that time (Figure 15). Figure 16 shows one of the small types and the large white type together with a dollar bill in the picture to provide scale. Garden egg plants get as big as jiló, which is the same genus and species, and both plants get much bigger than “traditional” European eggplant types. Garden egg grown at the UMass Research Farm can exceed six feet in height (Figure 17) For this reason it is recommended to use lower plant populations compared to European types. In 2014, researchers at UMass Amherst evaluated a selection of S. gilo from Brazil that was white. Plants were spaced 1’ in the row on black plastic with 6’ between rows for a plant population of 7,000 plants/acre (Figure 18). As garden egg matures, it will turn different colors from its immature white. 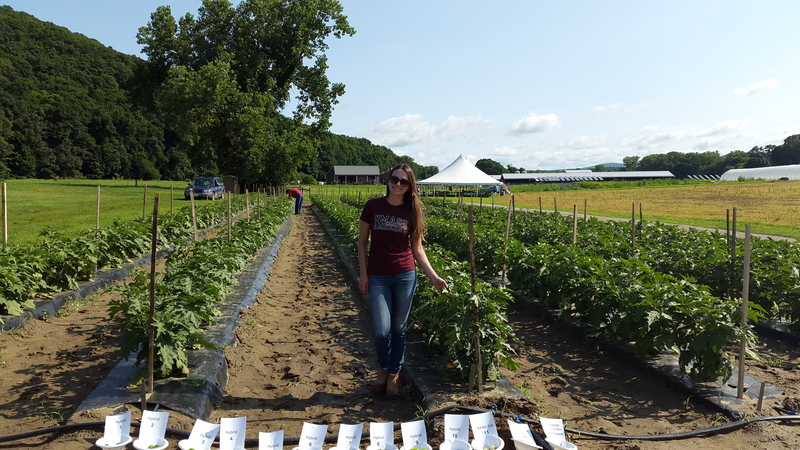 The variety we grew at the UMass Research Farm in 2014 turned a yellowish color as it matured (Figure 19) and then red when fully mature (Figure 20). The market prefers garden egg when immature, but some African ethnicities will accept them when mature. As an eggplant, one can expect to have the same pest issues as with traditional eggplant. For information on fertility and pest management of garden egg, refer to the New England Vegetable Management Guide, and click on "eggplant". At the end of the season, ande before we save any seed from mature fruit, we use a PTO-driven rotovator to chop up the left-over fruit and plants and then incoporate the choped-up plant residue and degradable plastic, and then seed a cover crop. Video taken by Zoraia Barros showing the PTO-driven rotovator chopping up garen egg on November 2, 2016. At the present time we are not aware of any commercially available seed of garden egg in the United States. You will most likely find “hits” with sites that have garden egg seed, or what looks like garden egg. You than want to make sure that the seed that a particular company has is in fact garden egg. It is recommended to contact the seed company to get assurances that the seed is in fact garden egg. If you do find fresh garden egg for sale in markets, save seed from mature fruit and trial that seed for production. UMass Amherst has produced a video that describes how to save seed from mature garden egg and jiló. As described in the video, it is essential that the garden egg fruit is mature before saving seed. The seed in immature fruit is not viable. Optimum storage temperature for eggplant is 50 F° with relative humidity between 90 – 95%. 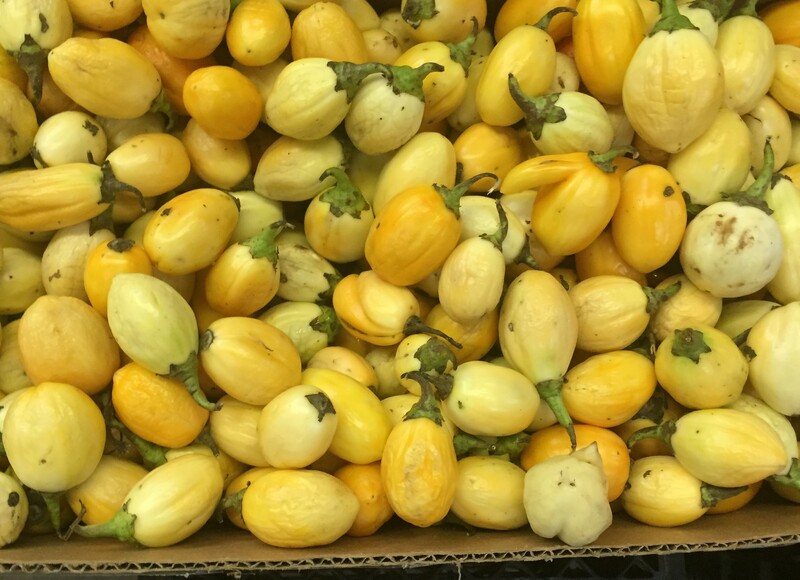 See Table 16: Handling Produce for Higher Quality and Longer Market Life for eggplant. In Massachusetts, we pack garden egg in ½-bushel wax boxes (Figure 21). Garden egg is very popular among Africans from certain regions of this continent, as described above. As is the case with any new crop that a farmer wants to grow, it is important to make sure that there is a viable market for it BEFORE planting it. In Massachusetts, harvest of garden egg begins in mid-late July. There has been competition with garden egg that comes into our region from New Jersey. The wholesale price set by researchers at UMass Amherst has been $2.00/lbs. and this price has been maintained throughout the season. Retails sales have been $3.99/lbs and higher. Aliero, A.A. (2007) Response of four Solanum species seasonal dynamics in Sokoto-Nigeria. International Journal of Agricultural Research 2(1), 62-68. Danquah, J.A. and K. Ofori. 2012. 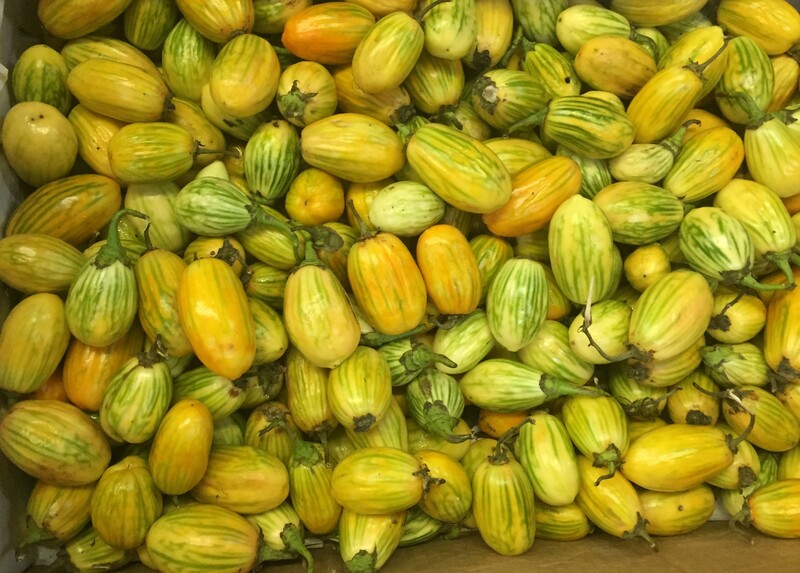 Variation and correlation among agronomic traits in 10 accessions of garden eggplant (Solanum gilo Raddi) in Ghana. I.J.S.N., VOL. 3(2) 2012: 373-379. Horna, D., Timpo, S. and Gruere, G. (2007) Marketing underutilized crops: The case of the African garden egg (Solanum aethiopicum) in Ghana. Global Facilitation Unit for Underutilized Species (GFU) Via dei Tre Denri, Rome, Italy. Nwosu, I. Interview by F. Mangan and Z. Barros. Personal Interview. CISA office Deerfield Massachusetts, May 16, 2016. Siemonsma J.S. (1981) A survey of indigenous vegetable in Ivory Coast. Proceedings 6th African Symposium on Horticultural Crops. Ibadan, Nigeria. National Research Council of the National Academies. 2006. Lost Crops of Africa. Volume II Vegetables. Chapter 7. Eggplant (garden Egg). The National Academies Press. 354 pages. http://www.nap.edu/read/11763/chapter/9#137 Last accessed on April 27, 2016.